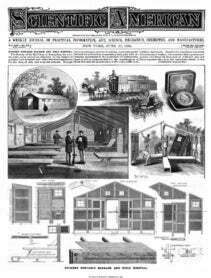 For some time past there has been found in the market a very interesting product consisting of extremely thin and slender shavings of wood, that are comparable to paper cut for packing, and that go by the name of “wood wool.” This product was first introduced into France as a packing material. It weighs about forty or fifty per cent less than the materials generally used for such a purpose. Its beautiful appearance, its fineness, and its extreme cleanness at once brought it into favor with shippers. It was afterward found that the material was well adapted for the manufacture of mattresses, for bedding for cattle, for the filtration of liquids,&apos; and for stuffing horse collars, etc., the most suitable species of wood being selected for each of these purposes. Its elasticity causes it to be considered as the best material for bedding, after horse hair ; and it is even preferable to any other substance when it is derived from resinous wood, since it does not then absorb moisture. In workshops, wood wool is tending to replace cotton waste for cleaning machines, and it has likewise found an application on the rolling stock of railways for lubricating car axles. While it has the same property that cotton waste has of absorbing oil, it costs ten times less than that material. All these advantages explain why the use of it, which is so extensive in America, is rapidly becoming&apos; general in Austria and Germany, and is beginning to extend in France. The accompanying engraving represents a new machine for the manufacture of this interesting product. It consists of a cast iron frame resting upon three supports of the same material, and carrying a driving shaft, which is actuated by two pulleys, fast and loose. To this shaft there is fitted a fly-wheel, one of the spokes of which is provided with a pin that receives one of the extremities of a connecting rod, while the other extremity of the same is connected with the knife carrier. This latter, which also rests upon the iron frame, slides in iron guides, and carries a set of peculiar knives arranged in such a way that the wood is cut in both the backward and forward motions of the knife carrier. The wood is held upright on the machine by a lever with a counterpoise, and on the sides by a stop at one side and a movable jaw at the other, that permits of introducing blocks of a few fractions of an inch in length. “ The wood is shoved forward under the knives by means of a click, that causes it to advance the requisite distance at every revolution of the flywheel. The &apos; wood used by preference in this machine is Riga fir. The blocks of wood-must, at a maximum, be 0&apos;465 millimeter in length, 0&apos;4 millimeter in width, and 0&apos;32 millimeter in thickness, and consequently the most economical and practical thing to do is to purchase commercial fir planks (which are 0 32 millimeter in width and 0&apos;08 in thickness) and cut them to the desired length of 0&apos;465 millimeter. In this way it becomes possible to operate upon four superposed pieces&apos; of wood at once. It takes a&apos; power ofabout four horses to actuate this machine. The production may reach 1,500 or 1,700 pounds of “ wool” per day of ten hours. It is unnecessary to have a special workman to run the machine ; any intelligent man can operate it. —La Nature.